The nostalgia for the Clinton years, the ignorance and amnesia about Bill Clinton's presidency, continues to confound me. I wonder how the 2000 elections would have turned out if Clinton hadn't helped imprison and disenfranchise potential African-American voters with this bill. 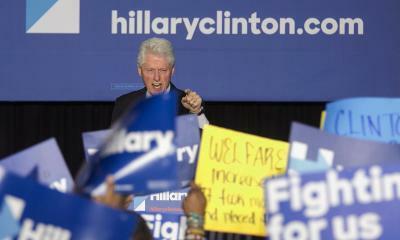 All of a sudden, Bill Clinton looks like a monster rather than a hero, and he now finds himself dogged by protesters as he campaigns for his wife, Hillary. And so the media has stepped up to do what it always does: reassure Americans that the nightmare isn’t real, that this honorable man did the best he could as president. ...The reason the 1994 crime bill upsets people is not because they stupidly believe Bill Clinton invented these things; it is because they know he encouraged them. Because the Democrats’ capitulation to the rightwing incarceration agenda was a turning point in its own right. But what is most shocking in our current journo-historical understanding of the Clinton years is the idea that the mass imprisonment of people of color was an “unintended consequence” of the 1994 crime bill, to quote the New York Daily News’s paraphrase of Hillary Clinton. This is flatly, glaringly false, as the final, ugly chapter of the crime bill story confirms.